Making the world Premier of first ever Infiniti Compact, company gained tremendous eyeballs at the Frankfurt Motor Show 2015. With the aggressive exterior and daring interior, the Infinit Q30 Active Compact 2016 made the entry with two version ‘premium’ and ‘sport’. 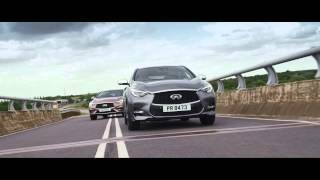 Let us have a quick look at the review of Infiniti Q30 Active Compact 2016 to know more about it. The interior of Infiniti Q30 Active Compact 2016 is drenched in high end materials. The interior isn’t just driver focused but also keeps in mind the comfort and entertainment of the passenger. Taking hints from the concept version the cabin portrays a ‘dual wave’ touch while the chrome trimmed A/C vents and the center stack design are a treat to eyes. Talking about the steering wheel, it is now three-spoke integration without the flat bottom and this I believe is the only change when compared to the concept. Looking at the interior you’ll find a lot of leather, wood and aluminum that are amalgamated together in certain volume and creates this impeccable essence. In all rounding up the interior details of Infiniti Q30 Active Compact 2016 I can say it’s luxurious, comfortable, safe and sporty. 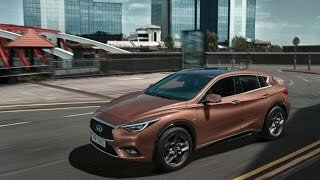 Just like the interior, exterior of Infiniti Q30 Active Compact 2016 is also heavily based on the concept that was recently unveiled in past. Starting with the front fascia of Infiniti Q30 Active Compact 2016 we have LED strips oriented headlamps sitting proudly on both the sides of the grille which has three horizontal slats. The splitter like element found in the predecessors finds its way out and the bumper gets more aggressive touch while the side air intakes get a new shape to compliment the entire body makeover. Unfortunately we do have any information regarding the rear proof the model but we expect the same aggression and boldness as the front fascia. 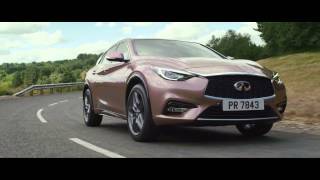 Thus rounding up the entire exterior details of Infiniti Q30 Active Compact 2016 I would prefer saying it’s stunning. In all the Infiniti Q30 Active Compact 2016 comes with five powertrain options (including all the trims). There are three options in petro and two in diesel; first two are 1.6 liter petrol engines generating total output of 120 hp and 154 hp and peak torque of 200 nm and 250 nm respectively. Third and last in this is 2.0 liter petrol producing total output of 209 hp and peak torque of 350 nm. For the diesel engine company is bringing a 1.5 liter and 2.2 liter engines with each of them producing total output of 109 hp and 168 hp and peak torque of 260 nm and 350 nm respectively. Each of these models comes with an option of seven-speed dual-clutch automatic transmission and six-speed manual transmission.